International Harvester Scout builds, restoration, and tales. The one thing that you can do to your International Scout to improve it’s reliability the most is to put in a new wiring harness. Some people assume that a new wiring harness just can’t be found 40 years after the Scout was made at the factory. We’re here to say you can. 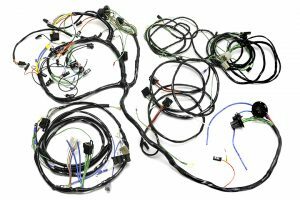 We make complete wiring harnesses for all years of Scout 80, Scout 800, Scout 800A and Scout 800B, Scout II, Scout II Traveler, and Terra. The original International Harvester harnesses were built to a very high standard. I am alway impressed with the consistency and durability of the original harnesses, but with time oxidation and resistance builds up on any contacts. To increase reliability, a new harness is one of the best thing you can do. 1969 1100D pickup – I like it!